I created a mod for The Elder Scrolls V: Skyrim that adds a scripture crafting system, available [here]. In other words, you can make books. Players can learn alchemy and brew potions, or smithing to craft weapons and armor, venturing into mines with a pickaxe to extract the metal ores needed and tanning pelts to create leather, etc. You have the opportunity to make most of the objects that you encounter-in game, except books… until now. I hope to maybe upload it to Steam or Nexus when I find the time (although I made it 4 years ago so no rush...). The world of Skyrim makes available over 300 books for the player to read full of juicy, delicious lore. Books are typically found in shops or houses, and certain books can be read to increase your skills (ie. reading a particular book on sword fighting will increase your skills in fighting with one-handed weapons). 1) Books are very low in value, despite the fact that this pseudo-medieval culture does not have printing presses: this implies that books were written by hand, and thus requires substantial labour to create. Marxist discourses, etc., but basically Skyrim’s valuation of commodities is unbalanced in this sense. 2) Players are not able to create books, which are one of the most common items in the game. 3) The Speech skill (which allows you to be more persuasive and haggle with shopkeepers) has few opportunities to be increased, and should be tied in with a developing literacy. 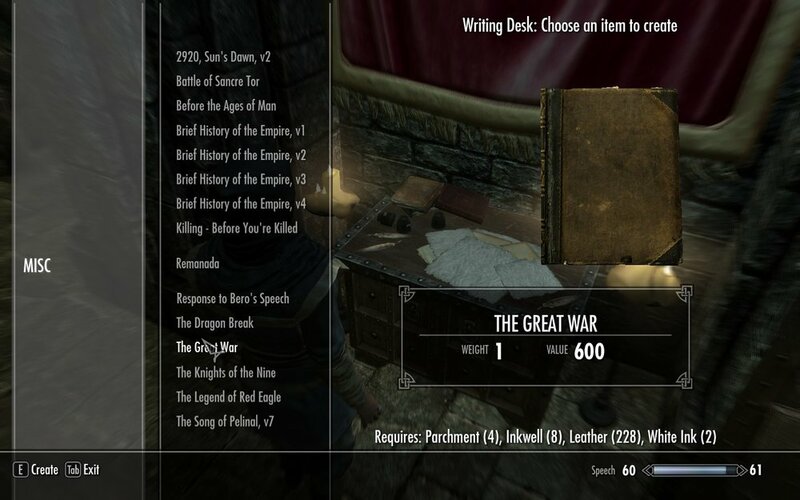 So this mod is made up of a few elements to fully encompass the book-creating process, short of requiring the player to actually write every word. Scroll down, dear reader. I renamed a few objects in order to be more historically accurate. Rolls of paper are now named parchment, as they were most commonly used for early books. As well, tanning racks are now named stretching racks. For the latter, this made sense as parchment is now craftable at these stations with one animal pelt; parchment is explicitly not tanned but instead is stretched. Maybe a future update will include vegan options with firewood used to create wood pulp paper? Many possibilities. Pots of ink, which were common-but-useless objects to create clutter in a room, are now a primary ‘ingredient’ in making books. They are also craftable at ‘ink mixing tables’ from firewood (which is in turn burned to create charcoal). For more valuable books, different coloured inks are needed, so I created several new items and different recipes to craft them. Each coloured ink is made from two appropriately coloured plants that are relatively common in the landscape. Additionally, at forges you can craft silver leaf and gold leaf (using silver or gold ingots respectively) for advanced decoration. All lore books (ie. not notes, journals or spell tomes) now have their own unique recipes, using the aforementioned items. They are crafted at the writing desk, an object found in over 21 different locations in Skyrim. Each writing desk offers a limited and unique selection of books that can be “copied”, depending on their location (ie. Bard’s College has song books, plays, and poetry), but crafting all the available books at all locations will give you all books in the game. 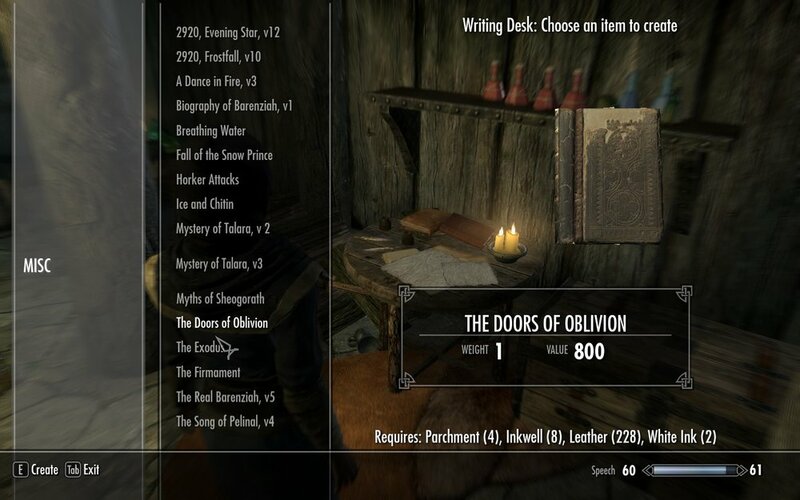 Orc books are at the Orc Strongholds, religious books are found at the temples and books about the Khajiit are found in the travelling caravans, so there are more than one place to find certain selections. Using this rationale, I figure it’s lore-friendly for the various schools and courts to have their own valuable books in their archives or libraries: anyone who wants to own a copy would have to go through the trouble of writing out the pages and then binding it in leather. Included in these books are the books that increase your skills when you read them. I adjusted the prices and changed the models so they blend in with normal books. I also increased the overall value of books, since the normal game price is far too low. These are handwritten tomes, and the amount of labour that goes into creating them should be reflected in a higher price. Crafting books also increases your speech skill level; as you create books it makes sense that your vocabulary would increase. While the player can steal books from houses, this system provides benefits from creating the books, and also offers new avenues for people taking a pacifist approach to their gameplay. Under the hood of the game, all books are sorted into five different levels that determine their value and the required player level for them to be commonly found in chests, from 0 – 4. I used this as a basis to create the different types of “recipes” for the books. By adding the level requirement, it ensures that players can expand their libraries throughout their gameplay experience; it also makes sense that players will gradually improve their literacy over time and thus be able to read more advanced or valuable books. After I made a spreadsheet of all the books (using a list from here) and multiplied their base price by 10, I then assigned them to different locations depending on the general theme of their content. I tried to make sure that there was a variety of levels for each location and then ensured that all locations had “recipes” with unique combinations of inks, leaves, and gems. Each book is given its own unique recipe, which was pretty simple but easily the most time consuming part of this. I also made the several ink items and their own recipes. The colours of the inks correspond to the colours of the book models, so there was some switching around to ensure there was a range of book designs at each location. Level 0 books use the journal models, as the pages aren’t bound, and Level 1 books use a ratty book model, so the book is binded but not decorated. I then created the “writing desk” and “ink mixing table” (name subject to change when I think of something better) and put them in various interior locations. Each of these crafting stations are made up of a bunch of static objects and while their appearance varies depending on their location, they are recognizable.